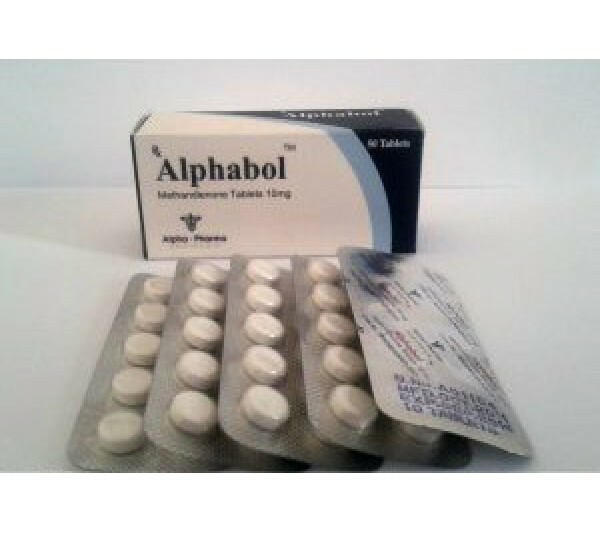 Alphabol is an oral anabolic steroid, the active ingredient is methandienone (methandrostenolone), from Alpha-Pharma. Athletes use long courses (up to 6-8 weeks) mainly for gaining muscle mass and increasing strength. It can be recommended to both beginners and athletes already experienced in the use of sports pharmacology. The first drugs similar to this (in pill form, based on methandienone) appeared on the market in the late 50s of the 20th century. This, in particular, was Dianabol (5 mg tablets), originally manufactured for medicinal use. Like many steroids, initially methandienone was not at all considered doping and was not forbidden to use by athletes until the end of the 60s. At that time, drugs with stimulating activity, like amphetamine, were mainly treated as doping agents. Customer reviews Alphabol, produced by the Indian company Alfa-Pharma, are more often positively described as a strong anabolic steroid that provides pronounced results in a short time. Since his appearance in the sport, the methandienone has not lost any relevance. His preparations are in demand to this day and are effective in almost all sports related to physical exertion (from bodybuilding to martial arts). The effect of Alphabol for an athlete is primarily a quick set of muscle mass (results - up to 10-15 kg per course in 6-8 weeks). Also valued are: increased performance, endurance and strength, increased appetite, alleviation of joint pain and improved function of the joints and ligaments, strengthening bones. There is even a moderate fat burning effect (due to fluid retention, this is not the best choice for drying the product, unlike mass-recourse courses, for which it is most effective). Side effects of Alphabol are possible, but subject to recommendations rare or mild. Apart from hepatotoxicity, side effects of estrogenic and androgenic nature are likely to be possible: water retention, gynecomastia, suppression of testosterone production, testicular atrophy, baldness, greasy skin, increased aggression, acne, and others. To prevent the development of consequences upon completion of the main course, post-course therapy is carried out - tamoxifen or clomiphene citrate is taken (for several weeks in doses of 10-40 or 50-150 mg, respectively). An anti-estrogen drug may also be required during the course, in particular with the observed development of gynecomastia symptoms. The recommended dosage of the drug for men is 30-50 mg per day. The frequency of admission is daily, due to the short duration of activity - about 6-8 hours. The course can effectively last up to 6-8 full weeks. Longer, as a rule, is not advised due to the increased risk of side effects and hepatotoxicity of the substance. The course of taking Alphabol can be effectively carried out not only by men, but also by women in sports. However, for athletes, only reduced doses are allowed, otherwise the development of virilization cannot be avoided: at a dosage of more than 5-10 mg per day, side effects associated with increased androgenic activity are almost inevitable. What is the best way to take Alphabol combined with other drugs? This question is not a short answer. Depending on the goals, it can be effective in administration with nandrolone decanoate, trenbolone enanthate or hexahydrobenzyl carbonate, testosterone enanthate or cypionate, metenolone, stanozolol injections or other steroids. To select drugs should not only in accordance with the priorities, but also based on their own level of training and experience in the application of sports pharmacology. For a quick and following a strong set of muscle mass, a course with nandrolone decanoate and testosterone enanthate is effective (it can also be cypionate or a mixture of esters, like Sustanon). Doses - an average of 20-50 mg of methandrostenolone per day, 200-400 mg of nandrolone per week, 250-500 mg of testosterone per week. This is a strong anabolic and androgenic ligament and the risks of side effects are significant. Not only post-course therapy is obligatory, but also the use of a booster of free testosterone (mesterolone) and an aromatase inhibitor (anastrozole) directly during the course.